I wrote about The Trash Pack a few weeks ago, a new toy craze that has taken the U.S by storm. Named after all the delights you might toss in a trash can – Smelly Sock, Germ Worm, Scum Gum, Stale Bread, Sour Snail, Putrid Pizza, etc. – this garbage-themed line of toys for kids was created by Moose Toys, an Australian toy company. We recently added the Trash Pack Garbage Truck to our growing Trashie collection. It’s a lot of fun and a great way to store the Trashies and trash cans when the girls aren’t playing with them. There’s room for up to 10 of the small trash cans, or a few of the bigger ones. The trash cans are a big selling point when it comes to The Trash Pack, so it’s great that you can incorporate them. The truck is mobile, so kids can roll it along the floor like any other toy car, but it also has some cool features! Like a real garbage truck, this one has tip ‘n flip action that allows you to dump your Trashies into the back of the truck. You can even set your Trashies on the top of the wheelie bin and launch them off. The doors of the truck open up and have little points to display the Trashies. Maya has this open on her desk when she’s not playing with it. There are seats in the cabin for a driver and passenger… and the truck comes with two exclusive Trashies, Sludge Can and Dead Tyre. One important thing to keep in mind is that this garbage truck is for kids ages 5 and up. Ours has been thrown around a few times by the girls and their friends, and the doors have popped off here and there. While it’s easy to stick them back in, it’s not made to withstand the rough treatment which toddlers are known for. Trashies can pose a choking hazard to children under 3, anyway, so they shouldn’t play with this line of toys at all! Visit www.trashpack.com for more information, and be sure to follow The Trash Pack on Facebook for news and contests! There are hundreds of Trashies to collect and trade, each with a level of rarity: common, rare, ultra rare, and limited edition. For example, there are only 500 of the limited edition Soggy Tomato Trashies in the entire United States… so odds are slim that you’d find one, right? Think again. A lucky TDB reader is going to win one! What would your kids think if you won them one of the rarest Trashies there is? A winner, chosen at random, will win the sought-after Soggy Tomato Trashie, along with a Trash Pack two-pack, which includes one large can, two Trash Pack characters, and one collector’s guide for easy reference of all the Trashies. Disclosure: I was provided with the Trash Pack Garbage Truck for review purposes, and the company is also supplying the giveaway prize. My best soggy tomato dish is a easy meat pie that I make with tomatoe sauce, cooked ground beef, tomatoe sauce & covered with mozzarella cheese. I just realized I need to leave a separate comment to say that I subscribed. Oh soggy tomato dishes. That takes me back to my childhood, riding the rails with my favorite hobo uncle. After a full day of train hopping we could pull together some of the best soggy tomato stew with chunks of possum, crushed pine cone, and mystery juice. If you take the time to pick out all the possum hair it will rival the finest meal you could find at any “big city” restaurant. I make a soggy Sheppard Pie with tomatoes. Soggy tomato and egg scramble- delicious and nutritious for breakfast or dinner side dish! I would be my kids’ hero if I won this!!!!! The best soggy tomatoe dish I make is goulash. I already am an email subscriber. I subscribed to feed by email. I make a mean soggy tomato lasagna! My dish would be Soggy Tomato and Basil Soup. My kids who like the trashies also like to eat soggy tomato soup with grilled cheese sandwiches for lunch. On Monday I made a tuna and noodle alfredo dish that had crushed wheat crackers and chopped Roma tomatoes on it. My daughter, who usually likes tomatoes, said these tasted “weird and gross,” so maybe, just maybe they were too soggy! I make a great soggy tomato sandwich with sliced tomato and mayo. Rotten soggy tomato and bacon sandwich. I have never seen these toys..yet knew instantly my 5 year old son would love them! 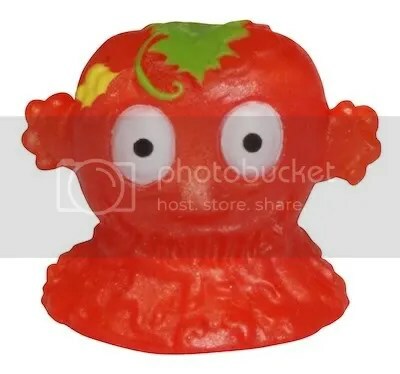 This Soggy Tomato Trashie would be great for my homeade tomato sauce which we cook on Sunday’s for our weekly Sunday night spaghetti dinner. First I would brown some putrid pork in some spoiled olive oil and let that simmer about 10 minutes. I would then add 4 cans of Soggy Tomato Trashies with spices of stale salt, smelly pepper, awful parsley, bashed basil and a pinch of stenchy sugar. I will cook it on low for 2 hours. A great dinner of soggy spachetti will be enjoyed by all! the appetizer will be some nachos with soggy tomato salsa. the main course will be putrid pizza with soggy tomato sauce. and last but not least, some holiday soggy tomato cake for dessert! eat them up yum. this rare tomato won our hearts and we can’t find him anywhere! subscribed to your feed by email!